The Music Lesson has been estimated to be painted between 1662 and 1665. the medium of the work is oil on canvas and the painting measures 74.6 x 64.1 centimeters. Not only that, but the painting that I have chosen could be found in the Royal Collection. However, what is the Royal Collection? Well, the Royal Collection is the name given to the amount of literary works, maps, books and textiles that are held by the Queen of England as sovereign for her sucessors and the Nation. Today, this collection is located in St James Palace in London, so that is where we can see nowadays the painting that I am analyzing . Now, I am going to proceed to discuss the most important elementsthat we find in this picture and to explain their meaning. To do that, I will try to follow an strategic order: I will start from the left of the painting exposing the importance of light in Vermeer´s paintings and explaining why did the author decided to use a marble floor and not another one. Then, I will focus on the main scene of the painting, that is, the girl playing the virginal and the gentleman looking at her, and finally, I will explain the importance that the picture that appears in the upper right side as well as the reasons for which Vermeer decided to include a white jar and a table covered by a wonderful carpet. 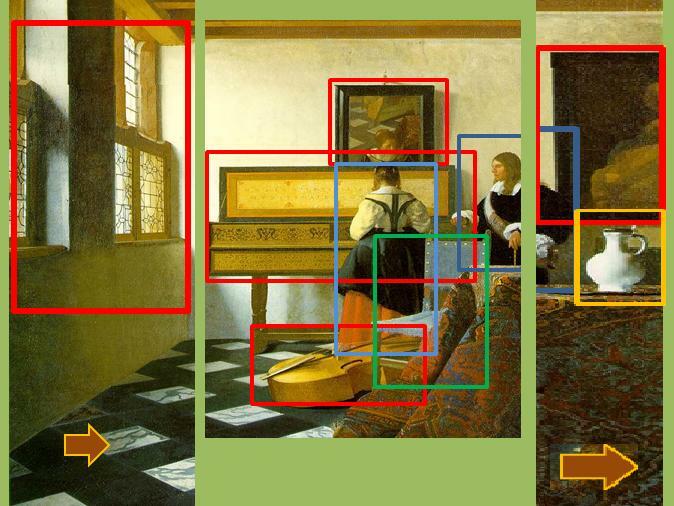 Begining with the analysis of the windows, it is important to say how The Music Lesson is the only painting with two series of windows in Vermeer´s collection. Not only thay, but when looking at th we notice that they are big windows, an that was something very characteristic of Dutch buildings, because this kind of window allowed to be too muc light in the room. So, in this case, the windows are used to illuminate the whole scene. 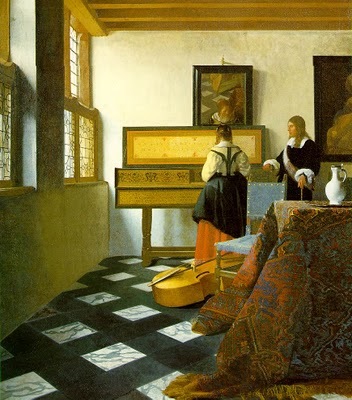 Another important thing is that there are not curtains, and that is very strange because in Vermeer´s times, curtains were hung to maintain a sense of privacy and silent dialogue inside the room, but this is not the case. The action is open to the audience. Paying attention now to the floor, it is important to pointout how it is made by marble. Marble was considered to be a luxurious feature destined only to the very rich people, so, and as some art specialists have said,Vermeer had probably visited some luxurious places, such as the local Deft Town Hall or the palace in Rijswijk, in order to use this type of floor on his paintings. Turning now to the main scene of the painting, it is important to talk about the virginal: it is a keyboard instrument that when it is closed it looks like a long wardrobe but when it is opened the visual effect that it creates is very striking because of the beauty of the printed papers that decorate all the front of the instrument. Besides, in this case, the virginal is decorated by flowers and sea horses, and it is very original because any patron of this motive has been found yet. The same happened with the viola: it was supposed to be added later on for iconographic motives. Besides, this music instrument is a constant symbol used in Vermeer´s paintings. However, the way in which it is represented is in a passive way, like waiting someone to play it. Talking now about the picture that appears on the right of the painting, it is important to say how some specialists have identified it as the one painted by Matthias Stomes called Cimon and Pero. There is also a parallel between this picture and The Music Lesson, because if paying attention to the figure of Cimon, we notice how he has chains on his hands. These chains symbolize the limitations of the man, so in the case of Vermeer´s painting it can be interpreted as that the gentleman that stands near the girl playing the virginal is limited just to hear the girl and not to play the music instrument. Not only that, but as it happened in the mythological story of Cimon and Pero, the man was seduced by the beauty of the woman ( his daugher), so there could be also a kind of parallel with The Music Lesson because as some critics think, the cavalier of Vermeer´s painting was in love with the girl. Finally, and if we pay attention to the right side of the painting we notice the presence of two important elements: the jar and the table. The jar is white ad made of metal; it sis the characteristic model that Italian artists tried to create or develop during the 16th and the 17th centuries inItaly. It is very difficult to see them, but there are too many details on this jar,nd the same happens with the carpet that covers the table. Both elements are decorative elements of extreme luxury and that is because high class people were very much interested in appearances. It means that all these luxurious objects gave these people the opportunity to represent the higher classes of the society and in the same way to put them in the spotlight of the whole society. As a conclusion, and bearing in mind all the things that have been mentioned before, I have to say that I decided to analyze this painting because although it represents a daily life action, to play music, there must be something hiden behind each of the elements that appears on it. Not only that, but the apparent simplicity of the panting has offered me the opportunity to think about many themes and possible topics for my final creative narrative. Good analysis. But picking up on your comments about the Royal Collection, it is spread around all Her Majesty’s palaces. One of around 7,000 paintings in the collection (making it three times bigger than London’s National Gallery), The Music Lesson is, according to http://www.essentialvermeer.com, in Buckingham Palace (only open during the summer months) and not in St James’s Palace. If the entire collection was crammed in the latter location, there wouldn’t be any room to move. However, it is often loaned out to various galleries/museums: the Fitzwilliam Museum in Cambridge (I think) and Dulwich Picture Gallery being very recent examples.